Finding your favorite series' is a breeze with our Difficulty & Intensity Filter! You can now find the right series or class for you by filtering series by difficulty and intensity level. This unique filtering feature is only available on our website, or by going to our Difficulty & Intensity Guide here. You can also find an additional guide that explains in detail how we define each of our difficulty and intensity levels. This guide also includes a table on how to match your existing difficulty level with your intensity level to find which series is right for you! You can find this guide by heading here. 1. Head to the Series tab located on the top-left hand corner of any Alo Moves website page, and select which style you would like to practice under the "all styles" menu. In this example, we will be looking at Vinyasa series'. 2. After clicking the style of movement you would like to practice, head over to the overview tab. Here, you will see a list of new releases, instructors, recommended series, and most popular series. 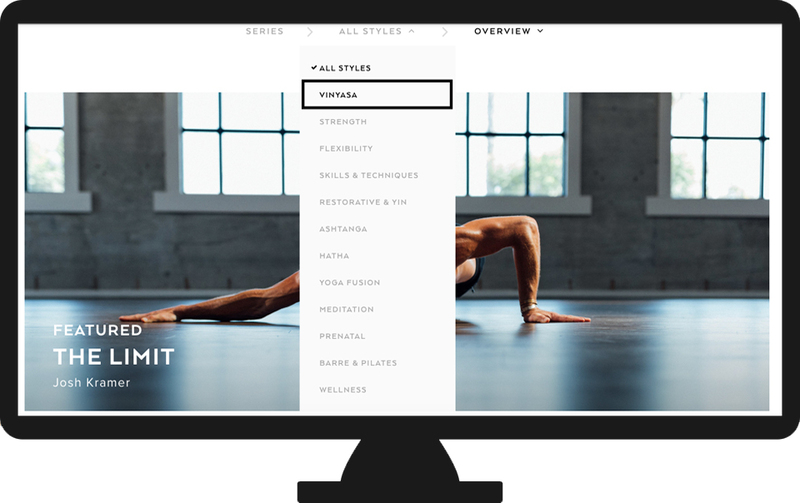 Go ahead and select "all" to see all series we offer within the certain style of yoga you selected. 3. You will then be directed to a list of all the series in the specific style you chose, and will see difficulty and intensity filters automatically appear on the left side of the page. If you are unsure of the difference between difficulty and intensity, you can hover over the question marks next to the words to find a description of each. 4. The Difficulty & Intensity Filter provides you with a list of 4 difficulty levels and 4 intensity levels. Choose which difficulty level and intensity level you are looking for to explore series within this style, and start practicing! For example, see the list of yoga series below with a "Intermediate" difficulty level, and intensity level of 3. You can chose any difficulty and intensity level combination to find which series best matches your level of practice. If you want to challenge yourself, select a combination you wish to work up to and explore series that can help you take your practice to the next level!